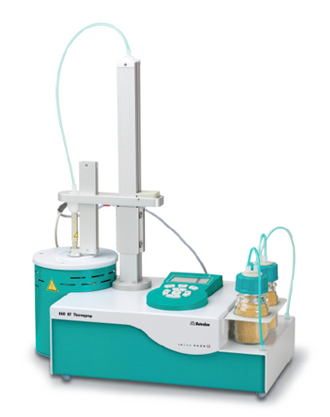 The 874 Oven Sample Processor is used for automatic thermal sample preparation in KF titration. The oven method is particularly suitable for samples that do not release their water until higher temperatures have been reached, for sparingly soluble samples or those that react with the KF reagent. Requires minimal preparation, so you are free to perform other tasks in the lab. Secondly, you increase accuracy and precision, which in turn reduces bias in the results. With the 874 KF Oven Sample Processor, the same procedure is followed every time, regardless of the technique of the operator, which ensures consistency and reproducibility. Substances that release their water slowly or at high temperatures (e.g., plastics or inorganic salts) are not suitable for a direct Karl Fischer titration. Other samples have a low solubility in alcohols, which may involve toxic solvents to promote dissolution and/or involve extensive sample preparation. Introducing these samples directly into the titration cell may contaminate it, and thus require you to exchange the titration solution and clean the cell frequently. There are still other substances that undergo side reactions with the KF reagents (e.g., ascorbic acid), which lead to false results. All of these problems can be avoided by using the KF oven method: the sample is heated in an oven and a carrier gas transfers the released water to the titration cell, where it is then determined by Karl Fischer titration. Since only the water enters the KF cell and the sample itself does not come into contact with the KF reagent, unwanted side reactions and matrix effects are eliminated. Choose the 860 KF Thermoprep for manual, individual samples or the 874 KF Oven Sample Processor for automating multiple samples. Both are very compact in size and feature integrated heating block, gas pump, flow meter and drying flasks. Includes built-in air pump and two drying bottles as well as an accessory set comprising 100 sample vials, 100 septa, 1 sealing tool. Sample preparation is straightforward with the 860 KF Thermoprep. The sample is weighed in the sample vial, and the vial is then sealed using a crimping tool. The hermetic sealing of the vials by the PTFE-covered septa prevents any moisture uptake from ambient air. Contamination and carryover effects are minimized as each sample is introduced into its own sample vial. The vial containing the sample to be analyzed is positioned above the oven and lowered into the heating block. The oven heats the sample, which releases the moisture. The dry carrier gas enters the vial and sweeps the moisture from the vial to the Karl Fischer titration cell. 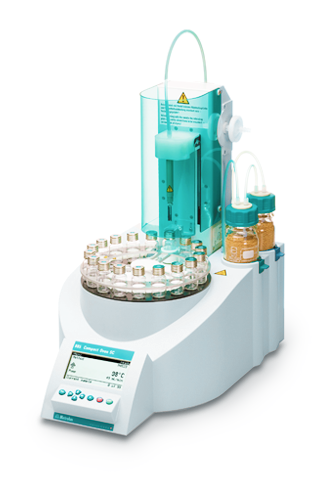 Depending on the sample’s water content, the subsequent KF water determination can be carried out volumetrically or, for trace amounts, coulometrically. The 860 KF Thermoprep can accommodate many different sized sample vessels. The oven is sized to fit Metrohm standard sample vials perfectly, but its construction is flexible enough so that it can be modified to accommodate almost any vial. In principle, the 860 KF Thermoprep can be used for all samples that release water at elevated temperatures. However, it is particularly valuable when a direct volumetric or coulometric Karl Fischer titration is not possible. You can determine the water content of solids (powders or granules), liquids of different viscosities, plus pastes and fats. 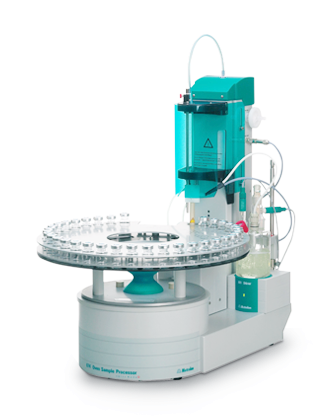 Metrohm’s newest model makes Karl Fischer titrations easier than ever before. It’s perfect for any sample that you want to analyze for water content—from low ppm to 100%! The 885 Compact Oven Sample Changer is used for thermal sample preparation in Karl Fischer titration. In the oven the samples can be heated up to 250°C. The moisture contained in the sample evaporates and is transported by a dry carrier gas into the titration cell, where the analysis takes place. The advantages of the oven method is that the sample itself does not get in contact with the KF reagent. This prevents contamination of the oven and titration cell; carryover and memory effects that could distort the results of the analysis are ruled out. Here is why Model 885 should be your next KF oven! Often imitated but never duplicated, learn more about our innovative technology behind analyzing moisture content. It’s right there in the name: 885 Compact Oven Sample Changer. Don’t judge it by its size, the 885 has the footprint of a dictionary, but has the power to replace your current single place KF oven. After weighing your samples, place up to 18 hermetically sealed vials on the sample changer rack and press a start to begin the series. Fill the rack with samples, standards and QC check samples—it handles them all! No matter if you perform coulometric or volumetric Karl Fischer titrations, the 885 Compact Oven Sample Changer can be operated with all stand-alone KF titrators. A comfortable and user-friendly keypad controls the 885 Compact Oven Sample Changer: just input the number of samples, your oven temperature and the gas flow – that’s all! Screw-cap vials can be used with the 885 Compact Oven Sample Changer; after measuring, unscrew the cap and clean the vial for future use - all you have to do is replace the septum!